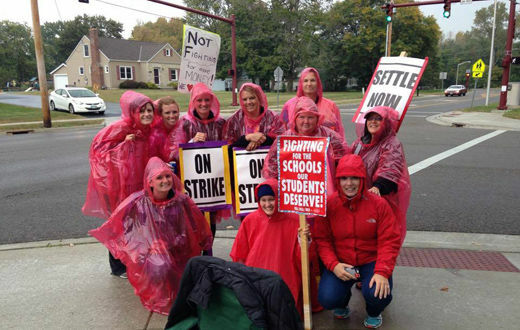 Teachers in the small suburban community of Reynoldsburg, Ohio, returned to the picket line for their second week of striking. The trouble started last May when the school board proposed a contract to replace the one that was expiring. The board’s proposed contract made teacher pay raises merit-based and replaced healthcare insurance with cash payment for healthcare. In addition, unlike neighboring districts, the board’s proposal has no limits on class size. Since that time the Board has made some concessions on pay raises and healthcare, but it still refuses to address the teachers’ concerns about working conditions, which have deteriorated over the last year. In fact, nearly one out of every five teachers left the district in the past year to seek employment elsewhere. The latest contract proposed by the board was very similar to the one voted down by teachers earlier in September. After a recent meeting between the district, the teacher’s union and a federal mediator, Reynoldsburg Education Association co-president Kim Cooper said she was “equally disappointed and unsurprised” that the board of education has failed to address the issues of the strike. Cooper also commented that the district officials left the talks prematurely. While the strike is underway the district is using online lessons and scabs brought in from Michigan and paid at higher rates than substitute teachers ordinarily get. This has resulted in a situation in which the quality of education is so poor parents are suing to have the schools shut for the reminder of the strike. The Reynoldsburg Education Association has held several rallies in the area that are well attended by parents, students, teachers, elected officials, and supporters from across the region. At one recent rally, parent Debbie Dunlap implored the Board not to tie teachers’ raises to measurements of “quality” that are out of teachers’ control. 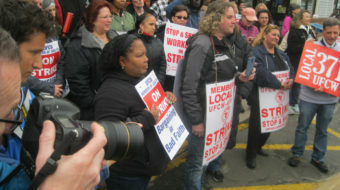 There is some speculation that there is more to this strike than meets the eye. Reynoldsburg school superintendent Tina Thomas-Manning has close ties to Governor John Kasich and the state board of education. This has led some to believe that the current strike in Reynoldsburg is a back door effort by the Governor to weaken the teachers’ union. Kasich has attacked the teachers’ union before with his infamous Senate Bill 5, which aimed to take collective bargaining rights away from teachers and other public employees in the state. SB 5 was defeated by the voters of Ohio, but Governor Kasich’s hostility toward unions and the working people of Ohio seems to continue unabated.